As Game of Thrones enters its final season, characters are crossing paths with each other in unexpected ways. One of those pairings was on display in the season premiere, when Daenerys Targaryen visited Samwell Tarly at Winterfell, with Jorah at her side, to thank Sam for finding a way to heal her favorite knight's near-deadly greyscale. The sweetly funny moment, in which Sam semijokingly asked for a pardon for stealing the texts he stole from the Citadel and used to find a cure for Jorah, took a dark turn when Sam mentioned his family. Back in season seven, Sam's father, Randyll Tarly, broke his oath of fealty to House Tyrell, allying himself with the Lannisters and sacking Highgarden. He brings his forces to join with the Lannisters, but his decision turns out to be a fatal one. Their combined army is cornered by Daenerys and her Dothraki army, and Randyll, along with his son Dickon, are captured and brought before Daenerys, who gives all her prisoners a choice: bend the knee and join her in building a new world or refuse and die. While many of his men immediately pledge allegiance to her, Randyll refuses, claiming he already owes loyalty to Cersei and will not bow to another queen. Tyrion Lannister attempts to intervene and persuade him otherwise, but he remains defiant. Dickon follows his father's lead and insists that he will die alongside his father, much to the dismay of Randyll and Tyrion alike. Not wishing to appear weak or open a loophole for future traitors to exploit, Dany refuses to imprison the Tarlys and instead executes them both - she has Drogon breathe his fire on them, killing them instantly. 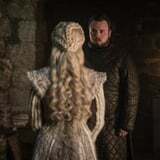 Having been separated from news of his family for some time, Sam has had no knowledge of his father and brother's death until Daenerys is forced to break it to him. While it doesn't appear that the revelation will ruin Sam's loyalty to the Stark-Targaryen alliance, given his abiding loyalty to Jon Snow, it certainly shook him. But this is Game of Thrones, after all - even the sweetest characters aren't immune to suffering and tragedy, and there's probably more to come as the final episodes continue.